Halloween 2014 info about the game-Games2Rule. 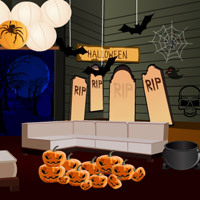 Halloween 2014 is another point and click escape game developed by games2rule.com. Eve Halloween night someone trapped you inside a scary house and you have to go for Halloween 2014 celebration. What will you do? You are trapped in this house. You have to escape from here by using the available objects. Check carefully in details, you have to find something surprising and useful or even critical, which may be helpful to get you out of the sealed room. Don't be scared, there is always a way to get out of it, all you need is patience and a little carefulness. Happy Halloween! Good luck and have fun!